Rockstar’s Red Dead Redemption 2 Western atmosphere action-adventure RPG title was highly anticipated by all. Players will take on the role of Arthur Morgan, an outlaw and a member of the Van der Linde gang during 1899. While the “2” in the title makes it sound like it’s a sequel, it is actually a prequel to Red Dead Redemption. In order to keep yourself alive you will need to cook meats that you gain from hunting, these vary from animal to animal and even some can be seasoned giving an extra recovery to stats. If you play Red Dead Redemption 2 like me you probably forgo all meals until the game yells at you to eat something. Normally players will eat at camp, in saloons, or in the wild using the camp feature. 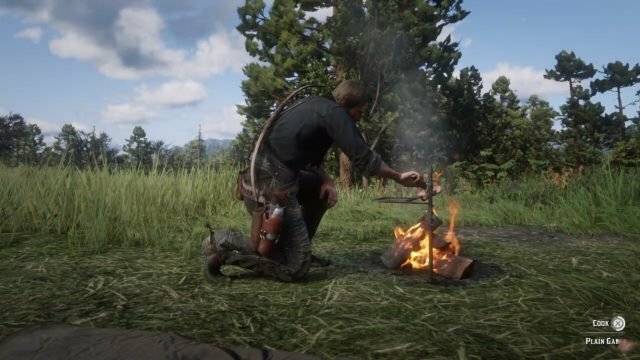 Just an open fire and some meat is all that is required to get a nice warm dinner in your belly. Note: Seasoned Meat – Seasoned meat needs to be a grilled over a fireplace. Set up camp and cook it. Chain Pickerel, Lake Sturgeon, Largemouth Bass, Muskie, Northern Pike, Perch, Redfin Pickerel, Rock Bass, Smallmouth Bass. 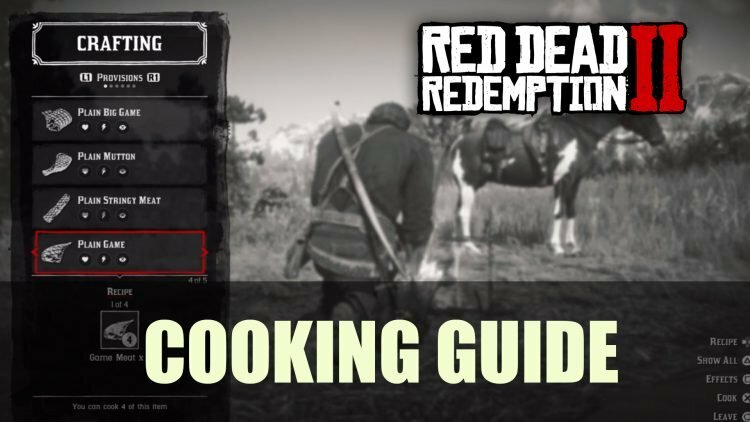 If you want more Red Dead Redemption 2 guides be sure to check out Red Dead Redemption 2: Horse Guide, Red Dead Redemption 2: Purchasing Weapons Guide and Red Dead Redemption 2: All Pamphlets Location Guide. You can also check out our Red Dead Redemption 2 wiki for all your outlaw needs.